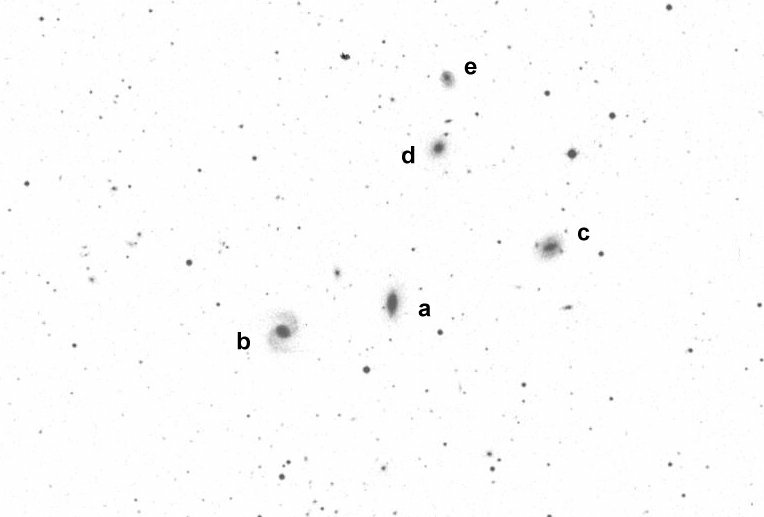 Except for NGC 3820 ("E"), this is a pretty easy quintet on the Leo-Virgo border. The brighter member, NGC 3822 is fairly faint, small, oval N-S, with a brighter core. N3825 ("B") is situated 3.2' ESE and appears fairly faint, very small, round, small bright core, stellar nucleus. Returning to NGC 3822 and moving 5' WNW brings you to NGC 3817 ("C") which is also fairly faint, fairly small, oval ~E-W, brighter core. A mag 11 star is 2.7' NNW of center.